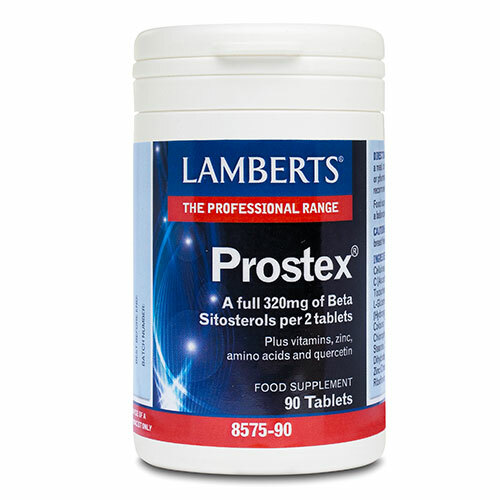 The Lamberts Prostex provides a full 320mg of actual beta sitosterols per 2 tablets, containing the highest quality available. This formula also contains 10µg of vitamin D3 per daily dose, since it plays an important role in the normal function of the immune system and healthy inflammatory response. 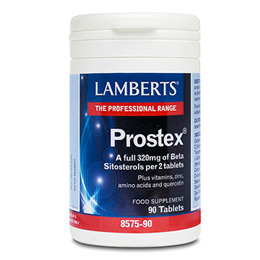 Lamberts Prostex also helps to support prostate health in men. Zinc, which contributes to the maintenance of normal testosterone concentrations in the blood is included at 15mg. Plus both the vitamins C and E have been included which, like zinc, contribute to the protection of cell constituents from oxidative damage. Prostex also includes three important amino acids – alanine, glycine and glutamic acid, as well as a relevant level of the bioflavonoid, quercetin. Calcium Carbonate, Cellulose, Phyosterol Complex, Vitamin C (Ascorbic Acid), Vitamin E (d-alpha Tocopherol), Glycine, L-Alanine, L-Glutamic Acid, Tablet Coating (Hydroxypropyl Methylcellulose, Colours: Titanium Dioxide & Copper Chlorophyllin, Glycerin), Magnesium Stearate, Silicon Dioxide, Quercetin, Dihydrate, Crosslinked Cellulose Gum, Zinc Citrate, Thiamine Mononitrate, Riboflavin, Glycerine, Vitamin D3. Take 2 tablets daily with a meal, or as directed by a pharmacist. Below are reviews of LAMBERTS Prostex - 90 Tablets by bodykind customers. If you have tried this product we'd love to hear what you think so please leave a review. 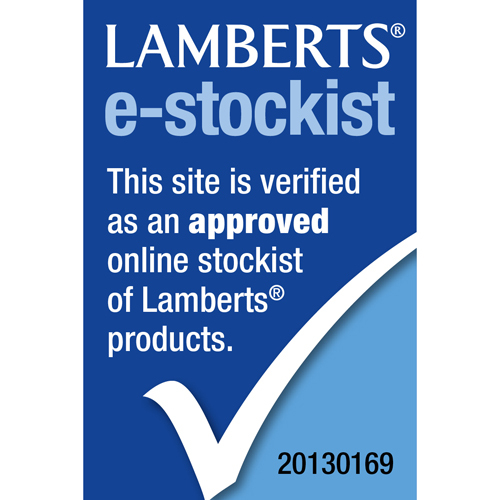 The Lamberts Prostex provides a full 320mg of actual beta sitosterols per 2 tablets, containing the highest quality available. This formula also contains 10µg of vitamin D3 per daily dose.